My first card is for Jazzy Inspirations and we had to base our cards off the album posted above using the colors: pumpkin pie, rose red, elegant eggplant & kraft. We could also use white if we wanted to but Idecided to use very vanilla because I felt that it calmed these dangerous colors down LOL!! I had to use my fave set Heartfelt Thanks after seeing these colors because I feel that this set makes any color combination beautiful. I'm not sure if you can tell from the pic but I also stamped the purple using En Francais....I think it came out very elegant. As far as the sketch, I used Jen's SFYTT. 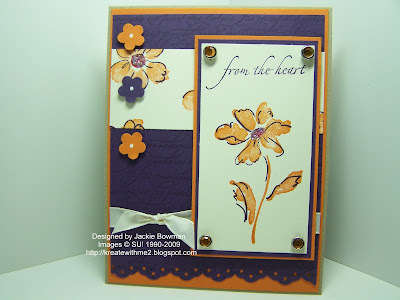 Check it out and play along with us.....if I can make a card with these colors; I know you can!!!!! This week we're featuring Angel Food Etsy's Shop. Aren't these some delicious looking cookies? They're so beautiful and yummy looking that I had to choose this pic as my inspiration piece for this week's Etsy Design post!!! I saw the colors in these gorgeous things and thought about Mercy's sketch too....what a nice combo!! Thanks Mercy! Wanna play with us? Browse through her SHOP, pick a picture to use as your inspiration & post on Ashley's blog. Very simple and I hope to see your pretty creations this week!! I bought an Ott Lite yesterday. I'm going to play with it's positioning a bit more but overall I think my pics look better in this light.....any opinions would be appreciated. Well, I need to get last minute details ready for my downline meeting today. I appreciate you stopping by and have a great rest of the day! Jackie! You just keep amazing me! These are gorgeous! I love the "Love" card, but then, I'm definitely a pastel person! I'm dying for an Ott light! Heck, I need a digital camera first!!! LOL! Question: How did you get your Jazzy Inspiration "inspiration" picture small? When I upload a sketch or the sample of what was my base, it comes out the same size! Thanks for the help! So pretty! OMG! 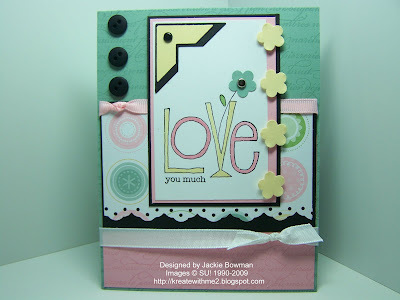 I love that color combo and am trying to think of a stamp set I have to use it on!! I gotta go think....oooh it could be dangerous! LOL! TFS!! I think you did a great job on both of your Inspiration Cards. They both fit the inspiration pieces well!!! Your Etsy card is so soft and pretty, yet involved enough to be really creative and hip!!! great job - the card and cookies look great! Yay for new lights!! That first color combo is HARD- I don't know if I can do it to be honest! I LOVE LOVE that second card! Great use of the valentines set in a non valentine way! your cards are just beautiful! I love them both. Very Pretty! Those color combos are wonderful! You are a true talent! Wonderful cards, especially the LOVE one - it has such a great 1950s feel! Gorgeous cards, Jackie. What a funny comment about the dangerous colors. That made me chuckle. You did a great job making them work. 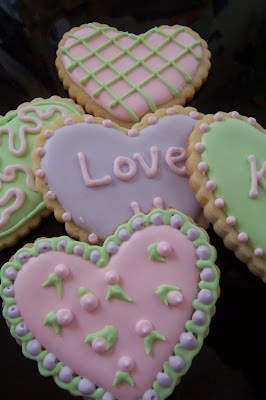 Love the softness of the second card, and yes, those cookies look delicious! Your cards are just awesome. Love both of the cards!! I have to say that the top card has a beautiful color combination and the bottom card is beautiful!! So soft and pretty!! You did a bang up job on your double design team post!! ;) Not scared at all....but intrigued for sure!! TFS! That's a great color combo. The purple would have scared me away. I rarely use it because it's so bold. I really like the spring-y feel of your second card with those yummy colors. Your Heartfelt Thanks card is absolutely stunning. I read the color combo and was a little frightened, but you nailed it beautifully! Fantastic job! And your "Love" card is really cute too! Love the blue on the first card. Hey Jackie!!! Love both your cards :) I especially love the colors for the EI card! Jackie, the colors on this card are just as yummy as those cookeis. Very nice job! jackie...these are both great cards! i love the colors you used for my sketch challenge...to yummy! thanks for playing along with my sketch this week, sweetie! Both are sweet cards, especially the second, based on those yummy cookies! Good job as usual Jackie! Your cards are beautiful, Jackie....I love the colors on the heartfelt card and the awesome sketch on the second one....those cookies are some pretty yummy inspiration, for sure!! !